Dog Guard is a company that knows and loves dogs. We know that our customers love and care about the well-being of their dogs as well. Dogs need to stay safe when they are outside. 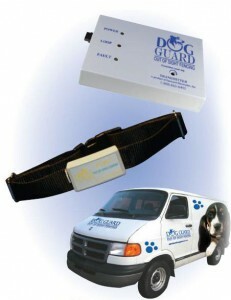 Dog Guard provides a wireless dog fence that will keep your dog safe and contained within the lines of your property. We offer a wireless, veterinarian-approved electric dog fence. NC dog owners will have the freedom of knowing that their dog will be happy and carefree while it enjoys the great outdoors. Thanks to our fence’s digital radio signal, your dog will stay within the boundaries that you’ve selected for your hidden fence. NC Dog Guard professional technicians will place a very thin wire underground. The dog will have a comfortable collar to wear that holds the receiver. The receiver will emit a stimulus as your dog gets close to your desired barrier. As the dog gets closer to the barrier, the receiver will emit another corrective stimulus so that the dog is prevented from leaving the area. Gently guide your dog away from danger zones using Dog Guard’s hidden fence. NC dog owners should know that every customer’s installation is different, so we customize your boundaries depending on the hazards from which you desire to protect your dog. We can protect them from roads, driveways, pools, shrubbery, and flower beds. The customer determines the areas that are included and not included in the pet’s area to roam. After your signal wire is initially buried around your containment area, we place boundary flags around the entire perimeter. While your dog is still becoming familiar with this containment area, you should walk your dog without a leash around this perimeter. Give it voice commands in order to train it to keep it away from the boundary flags in the ground. This will teach it to stay away from the underground wire, keeping it safe. Your dog should be able to learn that the reminder zone is between three and six feet from the wire. We offer a mild correction stimulus or an audio signal to remind the dog to stay within the boundaries. Dog Guard is the most innovative product for an underground hidden fence. NC customers know that it is the best product available in the pet fence market. We offer a T-4 transmitter with an outstanding range that includes 32 different levels for any and all adjustments. Every single system is given a code that is unique, creating a system that is immune to interference. Our products are safe, affordable, and reliable, while guarding and containing your pet from harm with a product that is completely out of sight. When your purchase a Dog Guard product, you are purchasing a product that is 100% Designed, Engineered, and Assembled in the USA. Our company is made up of dog-lovers and Dog Guard users, so we want to keep all dogs safe and happy. Our number one priority is customer service, and customer satisfaction is guaranteed. Our products are reliable, and we offer the Dog Guard promise. We know that ours are the best products on the market, so we offer a lifetime warranty on all of our equipment for the wireless fence. North Carolina customers can get a 30-day money-back guarantee when you buy our system. We offer products for any type of dog. We supply transmitters for outdoor use and indoor use as well. We also offer different receivers depending on the size and temperament of your dog. We have one designed for medium sized “stubborn” dogs or dogs that tend to be runners. We have a receiver for tiny dogs weighing less than 10 pounds. We also have a receiver for dogs from small to medium that may be more timid or passive. We have been protecting dogs and families for more than 26 years. Our products are always reliable, high-quality, and superior to other hidden fence products. We produce thousands of great systems for customers all over the country every single year. Our products are tried and true and will give you the reliability that you desire for your dog without spending a fortune. You’ll be so satisfied with your product that you’ll wonder why you waited so long to get your dog an electric fence. North Carolina is a beautiful state, so let your dog out to enjoy the scenery!